Nokia's camera guru Damian Dinning said that they've been integrating the ability to shoot videos with 30fps and in continuous autofocus mode in the coding of Symbian Anna specifically for the 12MP shooter in the Nokia N8. These features have been unofficially available as hacks for the N8, and the continuous autofocus, which allows you to point the camera near and far in the same video without losing focus, has been available in the CameraPro app in Ovi Store. Damian Dinning, however, said that they wanted to do these right, squeezing every bit of possibility out of the already excellent camera sensor on the Nokia N8. The funny fact is that the Finns obviously needed the code in the next version of Symbian - Anna - for these official upgrades of the 12MP camera capabilities. 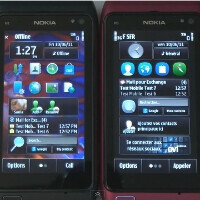 Thus, when the Symbian Anna update hits, it will bring not only eye candy, which you can see in the embedded long video demo below, but also additional functionalities to the Nokia N8. Nokia is on a roll today, and this news is certainly going to make some Nokia N8 owners happy. Sweet, good to hear Nokia's finally pushing out current software updates, but Anna needs to come as soon as possible. While the decision over Apple is still fresh in everybodys minds. What is wrong with the keyboard it is some kind of AZERTY instead of QWERTY hope is just the french version. also the spacing could be thinner Nokia doesn't know how to use space on screen. so much space waist in the menu why do I need to know the battery and network status in the menu and sub menu I would like to have one more line of app icons.come on nokia push it out. I'm f***ing haPPY! Finalli! bin waiting 4 dis a long tym! i will be happy if they release it now! For the N8 Only? FML! As long as there's a setting to disable continuous autofocus, I'm cool with it. Finally Nokia has listened carefully to it's customers and rolled out their newer improved version of Symbian aka "Anna". I am a Nokia N8 user and I can say that the camera is good and I am hoping that it'll be better once I get the Anna update. However, the phone is sometimes slow or lagging, if "Anna" can fix this it'll be great. Nokia has been continuously working on their software, but they have not worked on their phone's hardware in terms of it processor, RAM etc What new phones require is a faster processor, so that Nokia can add more of the tweaks that it's customers require and still have enough processing power to keep the phone running smoothly. The question is how long will it be before Nokia works on the hardware of it's phones..
good... but they will have to work on the hardware part too... like software there should be hard ware upgrades... the n8 touch is very sensitive that even if it falls once it breaks... otherwise software part is cool... hope this new updates wil clear the occasional hanging. i heard the maps were upgraded... why was that not shown? i also heard its got 5 home screens?